Today, solar PV is the third-largest deployed renewable technology in terms of global installed capacity, after small hydro and wind. The European Photovoltaic Industry Association (EPIA) reported that the world has passed the 100 GW mark in cumulative installed photovoltaic capacity in 2012. With between 30 and 32 GW added globally in 2012 – roughly the same figure as was added in the 2011 boom year – Europe saw just 13 GW of newly installed photovoltaic added, down from 23 GW. 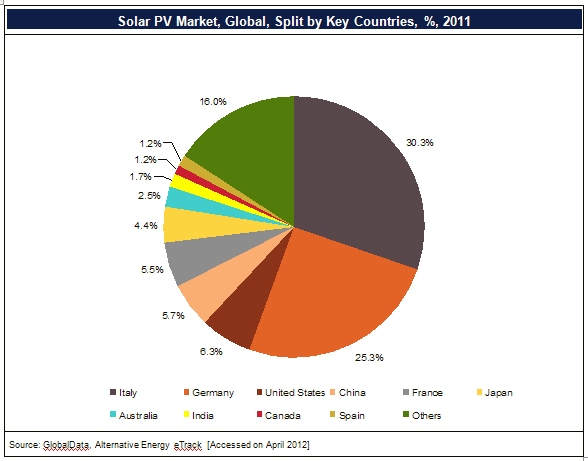 The fact annual installed capacity failed to grow to any significant extent is indicative of the troubles associated with a global oversupply of polysilicon and the trade disputes between China and the U.S., and Europe, but amid the gloom, Germany was still a world leader with 7.6 GW of solar capacity added and Italy was still the world's third largest market, with 3.3 GW. * just to put our situation into perspective; insignificant in this listing. "The photovoltaic industry clearly faces challenges but the results of 2012 show there is a strong global market for our technology. Even in tough economic times and despite growing regulatory uncertainty, we have nearly managed to repeat the record year of 2011," said EPIA President Winfried Hoffmann. He added, "The key going forward will be to address these new market challenges and continue policies that help PV technology to grow sustainably, continuing its evolution to a mainstream electricity source." 2. Funding and incentives offered to the solar industry by national and regional governments, financing schemes for consumers, and reductions in costs due to technological advances.